In my last post, I showed you how to calculate power for a t test using Monte Carlo simulations. In this post, I will show you how to integrate your simulations into Stata’s power command so that you can easily create custom tables and graphs for a range of parameter values. Statisticians rarely compute power for a single set of assumptions when planning a scientific study. We typically calculate power for a range of parameter values and choose a realistic set of assumptions that is financially and logistically feasible. 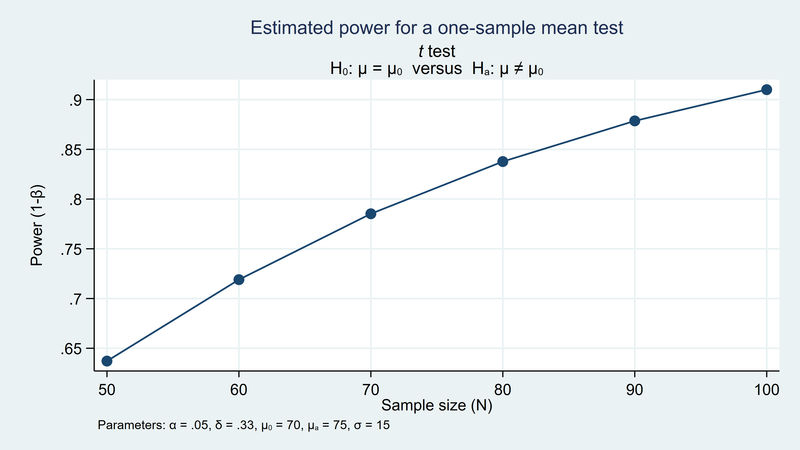 For example, below I’ve used power onemean to calculate power for sample sizes ranging from 50 to 100 in increments of 10. The table displays the assumed parameter values, including the alpha level, the means under the null and alternative hypotheses, the standardized difference between the means (delta), the standard deviation, and power for each sample size. 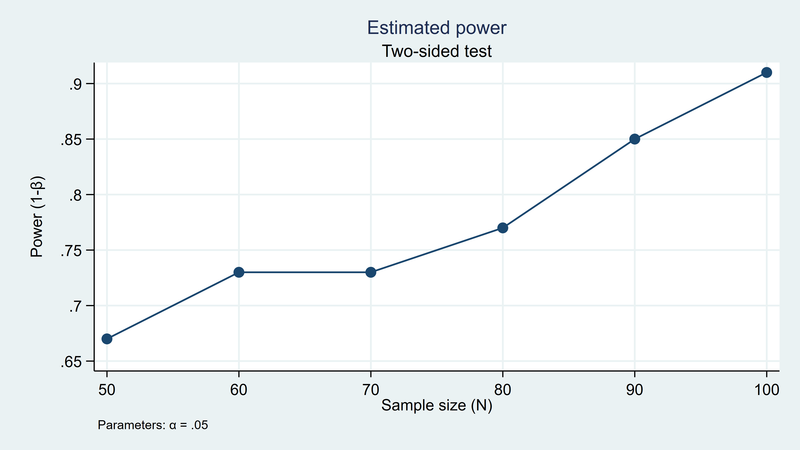 I’ve also used the graph option below to plot power over the range of sample sizes. I can then use the table and graph to select a sample size that meets the power requirements for my study. In addition to sample size, the power commands allow you to enter a range of values for other parameters such as the standard deviation, the means, or the alpha level. And power will create tables and graphs of the results. You can also add your own methods to the power suite of commands. Let’s add the t test simulation program from my last post to power to see how this works. Recall from my last post that we created a program called simttest to calculate power for a t test. The program accepts five input parameters, creates a pseudo-random dataset assuming the alternative hypothesis, tests the null hypothesis, and returns the results of the hypothesis test. We used simulate to run the program many times and save the results to a variable named reject. Then, we calculated power as the proportion of times that the null hypothesis was rejected.
. display "power = `power'"
You can add this simulation method to power by creating a program named power_cmd_mymethod, where mymethod is the name of the power command. Let’s call the program power_cmd_simttest. The code block below defines power_cmd_simttest. Note how similar it is to our simttest program. It begins with capture program drop, then program, and version 15.1. Next, we define the input parameters using syntax just as we did in simttest. Here I have added a new input parameter called reps(), which is the number of repetitions for the simulation. The middle section of the program runs the simulation and summarizes the results. Both simulate and summarize are preceded by quietly, which suppresses the display of their output. Here simulate runs the program simttest and saves the results to the variable reject just as it did before. Note that all the input parameters in both simulate and simttest are local macros defined with syntax. summarize calculates the mean of reject and stores it in the scalar r(mean). The bottom section of the code block returns power and the other parameters. The scalar power returns the mean of the variable reject, and the other parameters are simply local macros passed through from syntax. Now you can run the simulation by typing power simttest. It worked! You can even make a table and graph for a range of sample sizes. You could stop here if you wanted to consider only a range of sample sizes. But you will need to write one more small program if you wish to enter a range of values for the other parameters such as m0, ma, and sd. The program must be named power_cmd_mymethod_init, so we will name our program power_cmd_simttest_init. The code block below defines power_cmd_simttest_init and begins with capture program drop and program just as our other programs. Note that the program definition begins with the option sclass. The line sreturn local pss_colnames initializes columns in the output table for the parameters listed in double quotes. The line sreturn local pss_numopts allows you to specify numlists for the parameters placed in double quotes. 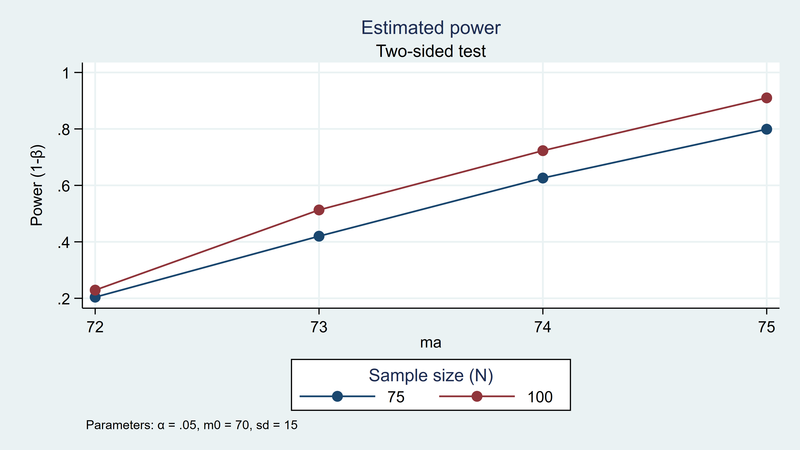 Now you can use power simttest to calculate power for a range of means assuming different alternative hypotheses. You can even do this for different sample sizes. And you can plot the results of your power analysis by specifying xdimension in the graph option. So far I’ve shown you how to calculate power using Monte Carlo simulations and how to integrate those simulations into power. I started with a simple t test example so that we could focus on the programming and check our work with power onemean. Next time, I’ll show you how to write power commands to calculate power for linear and logistic regression models using Monte Carlo simulations. See [PSS] power usermethod for more information about adding your own methods to power.